In a business world of uncertain budgets, relentless technology changes, scarce management talent, and intense production demands, theory is good, but practice sells. The Effective CIO: How to Achieve Outstanding Success through Strategic Alignment, Financial Management, and IT Governance is all about practice, successfully delivering the nuts-and-bolts for effective governance execution. It helps to dissolve the negative image many CIOs have as remote, purely rational decision machines, while demonstrating how to improve quality and throughput in your business.This authoritative text includes governance checklists, sample IT controls, merger and acquisition recommendations, and a detailed framework for IT policies. 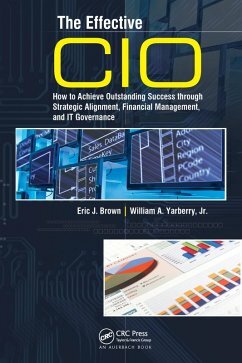 Authored by two highly regarded IT management experts, the book provides not only a survey of existing strategies, but also includes detailed problem-solving ideas, such as how to structure optimal IT and telecom contracts with suppliers, the implications of SOP-98, and accounting for software costs. The book seamlessly brings together two perspectives - that of a working CIO who must cope with day-to-day pressures for results, and that of an IT audit consultant with a special focus on governance and internal control. Unlike many other CIO-related books that merely discuss strategies, The Effective CIO includes easy-to-follow guidelines and governance principles that can be implemented immediately.